Hurricanes take no prisoners. Only lives. Hurricane Irene is fast approaching the eastern coastline. Many areas are under a mandatory evacuation. Yet, many people have decided to ignore the good sense of the authorities and stay. Materialism makes people ignore evacuation for Hurricane Irene. Flashing signs are everywhere, reports flash on TV, more warnings and advice are pumped out over the radio, the Internet is abuzz with cautions regarding people in MANDATORY EVACUATION areas. However, there are many people who have made the decision to ride the storm out. This is not an REO Speedwagon song, this is Mother Nature. And Mother Nature has proven time and time again, she takes no prisoners, only lives. Hurricane Irene is not the most powerful storm to hit the east coast. It is only a category 2 hurricane. However, it is massive. I covers the same area as the entire continent of Europe. With sustained winds of 100 mph at its eye, it is still churning a large amount of ocean water. A very large storm surge is predicted, followed by from 8 to 12 hours of heavy rain. 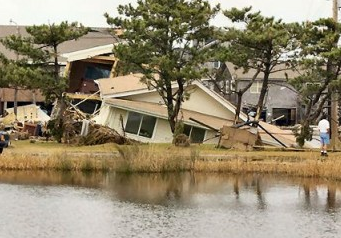 Right now, people living on the Outer Banks of North Carolina are most at risk. They have been told to leave. But some aren't. Why? They give a variety of reasons that don't pass logic. Some say that they want to be there in case something happens to their home. In case? The likelihood of something happening to their home is almost 100%. Hurricane Irene will create a storm surge that will hit the east side of the Outer Banks. Irene is projected on a path that is west of the Outer Banks, which will cause a secondary storm surge from the inner bay. This has never happened before. This is a perfect storm for disaster along the Outer Banks. But, there are stubborn people that think they can do something about it. What can you do? Stand in your front yard with your hands up, "Stop." Get a bucket and bail millions of gallons of ocean water? What could these people possibly do? Another excuse for not leaving a MANDATORY EVACUATION area on the Outer Banks is that residents fear the two bridges will be washed out and they wouldn't be able to return to their homes. How does this make any sense? If the bridges are gone, no one can get to you. And authorities have already said they will NOT send police, fire, or rescue to people who ignore the evacuation order. They will not put their people at risk to try to save delusional heroes. If the bridges are out, electricity, water and communications will probably be out. How will they get to food, water, etc. What if someone is hurt, how will they get to medical aid? What this insanity boils down to is materialism. They feel more attached to their property and possessions than their lives. If the storm surge is lapping over their roof, will they be more concerned at that moment about their Hummel collection or their Vegas memorabilia than their lives? I'd go for the latter, considering the circumstances. Let's say their homes are destroyed. Does it matter when they get back to them? What could they do when the roads are out, power is out, water is out? There are thousands of people up the eastern seaboard who are also under a mandatory evacuation order, even in New York City. Leave. Don't be a fool. Err on the side of common sense and caution. What if you're wrong on your decision to stay? You'll become a storm statistic that won't be in the good column. Stuff can be replaced. You can't. A bus is coming. You can get out of the way or face the consequences. The authorities can't make them leave. But common sense should drive them out of there faster than a garden hose on a hornets nest. But their stuff is what is keeping them in harms way. Yes, materialism makes people ignore evacuation for Hurricane Irene. I hope they bury them with their velvet Elvis painting.